I’ll introduce myself, I’m Oliver and wish you all a Happy New Year! I have a Passat 1.9TDI 100 hp bought new in 2001 with 250.000 miles on the clock, it has served us well. But a week ago, I noticed a noise when accelerating, a slight hissing sound (similar to a person trying to whistle with the mouth for the first time) and last night going up the bank that leads to our house I noticed a clear loss of power. By opening the hood I notices that there is quite a bit of oil that seems to have evacuated just before the turbo (see photo), after checking the engine oil level I notice that it is missing oil, on the stick Tester its arrives just below the level of the small band indicating the ideal location. 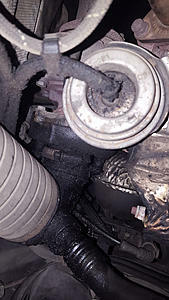 After reading multiple articles with similar problems, it looks like it's a turbo issue, so either I'm lucky and it's a hose burst or other to replace or it's the turbo or worse soI have to make a decision, because a new turbo + placement will surely be more than a thousand pounds and therefore it might be more wise to sell it to a scrap dealer and put the money towards a new car knowing that it has 17 years and 250.000 miles? So I wonder today what should be my way forward, knowing that I live 30 minutes away from the first garage. And is it wise to drive my car to one of these garages or should I call a tow truck? I thought I’d contact my insurance but I think that since the car is at my home it does not come under breaking donw? Here is my situation in a few words, thank you in advance for reading me. After making an introduction make a new thread about your problem or search TDI Wiki. Passat Failed MOT on emmissons. 01 1.8 turbo sucking oil in turbo?